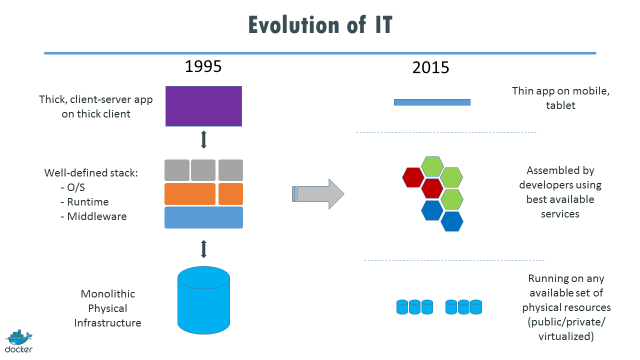 Over the last two decades, the software technology stack has undergone a rapid evolution, as this diagram from Docker.io lays out. 1. The development team is responsible for product design. 2. The development team is responsible for its own infrastructure. 3. Apps must be immune to infrastructure and service failure. Things get done through producer/consumer chains. Today, almost every business has to face the fact that their most serious competition is likely to come from companies living in the new technology stack, unencumbered by the old way of doing things. Governments and non-profits must realize that the people they serve have their expectations set by experiences with the cloud. If your organization is living in the old paradigm, it’s time to move on; big back end systems are rapidly becoming the COBOL of the 21st century. To assess the current situation, take a look at the value stream – the stream of activities that deliver value to customers – and identify areas of friction. In the modern technology stack, friction generators tend to be either deeply technical or highly organizational in nature, as you can see from the discussion above. Unfortunately, these are not usually the problems that companies tackle when they move to modern software development. Why? Quite often the organizational structure is so entrenched that changing it is not considered. Or perhaps the people leading the transition do not understand the underlying technology and the problems presented by the new stack. In either case, the underlying problem becomes an elephant in the room that everyone ignores, while easier challenges - like adopting agile processes - are taken up. It is important to confront the deep-seated friction generators that people would rather ignore. Start by talking about the elephant, and then actively imagine what your world would be like without that elephant. Once you have a clear vision of the future, you can work out how to move constantly toward that vision by eliminating the most pernicious friction generators, one step at a time. This approach has helped teams and organizations around the world make steady progress in the right direction, and eventually the steady progress adds up to amazing accomplishments. 1. One proven set of principles for tackling tough technology problems are the Lean principles: Focus on Customers, Energize Workers, Reduce Friction, Enhance Learning, Increase Flow, Build Quality In, Keep Getting Better.